This is one of my favourite new masks – it’s a real ‘doer’ that actually shows results! Some masks, I feel, are just glorified moisturisers; a mask should be a concentrated shot of ingredients, a treatment, something that targets specific issues. Of course, you may just want to relax and pamper yourself with a nicely-scented, soothing mask, and that’s fine – but if you want results, you need some active ingredients to get involved. Anyway, tingliness threshold aside, I love the effect of this mask. It has a very similar brightening results to some of the other rejuvenating masks that I like, including the Alpha-H Liquid Gold mask. 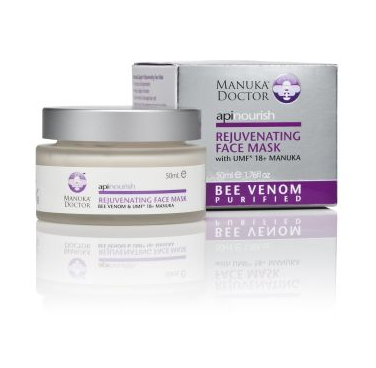 The combination of purified venom with antibacterial Manuka honey, moisturising avocado and shea and nourishing Vitamin E is an excellent one – the mask feels luxurious as well as functional. The results also seem to be cumulative – after a few weekly uses, I could see more of a difference each time, whereas I usually see a decline in the effectiveness if anything! 1) You must be an email subscriber or following via Google GFC (sidebar). Sorry if that’s a pain, but it does help to rule out quite a few of the people who ‘breeze’ through the internet looking for competitions! 2) Leave a comment below – tell me how you follow me (email or GFC) and make sure you leave your contact email in the comment form where prompted. Only I can see this! 4) This is open to ALL READERS, wherever they are in the world! 5) Important (and I’m being absolutely serious) – if you are allergic to actual bee stings. you must NOT use this product!